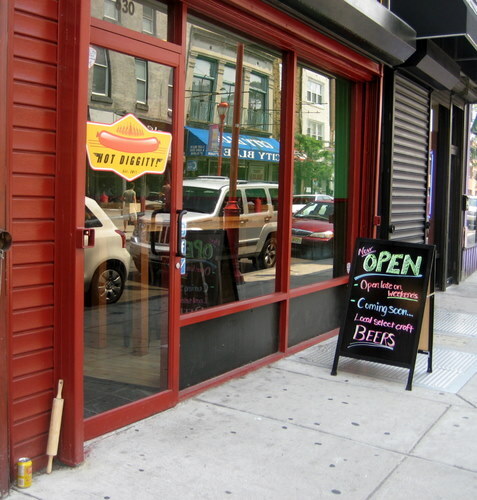 What’s not to like about fancy hot dogs at a spot with an adorable name? That’s why I had to head over to Hot Diggity to give their gourmet dogs a try. They even have beer! And belgian style frites! 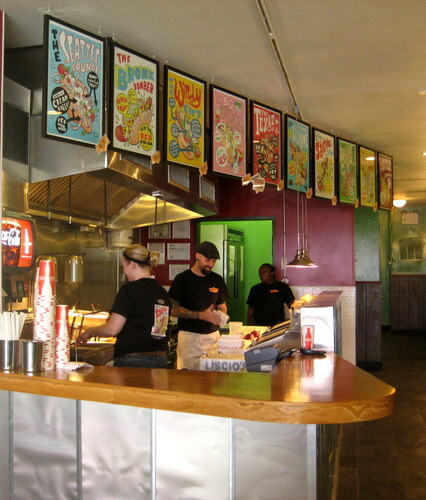 Located on south street, the illustrated menu (by local artist hawk krall) shows the ten different types of gourmet dogs, each topped with specialized toppings in a Licio’s hot dog bun. All dogs can be made as veggie. They also may have a seasonal dog here and there, the current one being a farmer’s market dog. The frites are served with 12 possible dipping sauces. 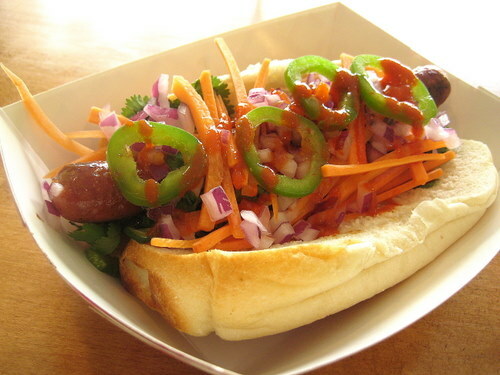 I got the saigon fusion, where the dog sits on house pickled cucumbers and is topped with shredded carrots, cilantro, chopped red onion, jalapeno, and a thai chili vinaigrette with sriracha. I loved everything about this damn hot dog! People have been raving about this one and I can see why. I’m especially in love with the damn sauce! The roll might be a little bit too much roll, as the dog itself is a bit on the scrawny side, as far as hot dogs go, but since there are plenty of fresh and crunchy toppings, it doesn’t overpower it too much. Everyone working there was super nice and friendly. And they get extra points for having Fanta on tap! I can’t wait to try some of their other dogs.